2012 marks the debut of RIZE Trading Cards! Their inaugural release, Rize Draft 2012, is sure to be hit with investors and collectors alike. These cards are gorgeous, with new, trending design concepts, and a limited production run. The content of this set is possibly the best, ever! It's loaded with over 100 of the top draft picks, rookies and blue-chip prospects in the game. 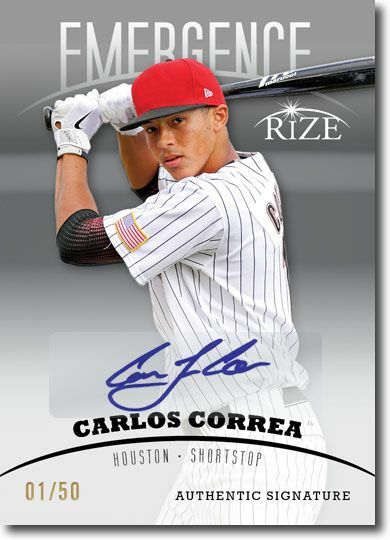 RIZE Draft also includes high-end, rare inserts, limited edition parallels (called "Paragons"), and certified autographs authenticated by Leaf Trading Cards! We just acquired some 2012 RIZE Draft product, and we bring it straight to you - we NEVER cherry-pick our cards! 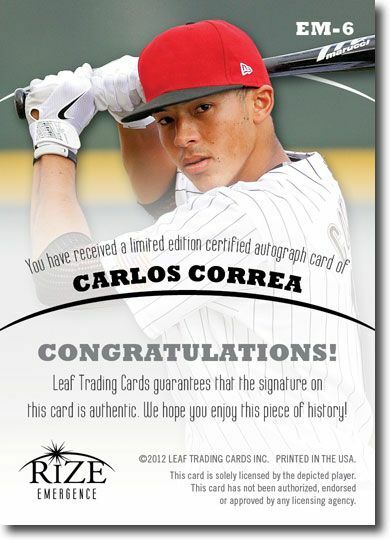 Certified, licensed through Leaf Trading Cards, and listed in the Beckett, you are bidding on a CARLOS CORREA 2012 Rize Rookie Autograph BLACK Auto Emergence RC #/50. Please see the scan of what you are buying - you will receive the very card you see in the scan - just not necessarily that exact number (with how many items we have listed, we just can't take the time to replace every image each time it sells). Still, your satisfaction is GUARANTEED! Email us with any questions before bidding! Thanks for looking, and good luck!